Annual ID Match Day post: Someone get a fire extinguisher! Last year I described the ID Match as a dumpster fire. Subsequent posts discussed why the specialty of infectious diseases is in trouble, and what we might do about it. I re-read those posts tonight, and I have nothing to add to them. My only question is: how does this end? The trend in unfilled programs, below, is shocking, with about 60% of fellowships now going unfilled, and 117 unfilled ID training positions. I've reviewed the list of unfilled programs, and without naming institutions I can tell you that it includes many of the top programs in the country, from coast to coast. 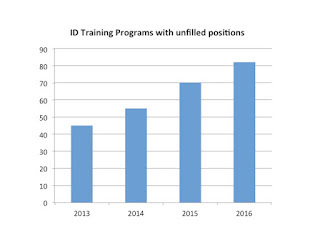 The problem now is that busy internal medicine residents who are interested in ID may consider their options and decide it is best to skip the match entirely, and to grab one of the many excellent training opportunities available after the match is over. Once this happens, the whole system begins to break down. My prediction is that the NRMP will kick our specialty to the curb sometime in the next couple years, and we'll be back to recruiting trainees the old fashioned way.